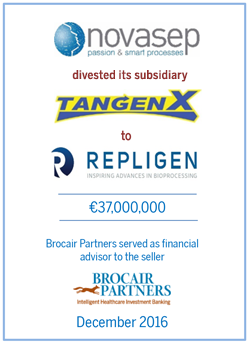 NEW YORK, NY – February 13, 2017 – Brocair Partners LLC, an investment banking firm serving the healthcare industry, advised Groupe Novasep SAS, which provides manufacturing solutions for life sciences molecules and fine chemicals, on its divestiture of TangenX Technology Corporation to Repligen Corporation for €37 million. TangenX Technology Corporation, based in Shrewsbury, MA, produces the single-use Sius™ line of tangential flow filtration (“TFF”) cassettes and hardware used in downstream biopharmaceutical manufacturing processes. Single-use Sius TFF cassettes are used in the filtration of biological drugs and are designed to deliver superior performance to traditional (reusable) TFF cassettes in a cost-competitive format that provides user-ready convenience and flexibility. Repligen, a NASDAQ-listed life sciences company focused on bioprocessing technology, stated that the acquisition strengthened its position as a leader in single-use bioprocessing technologies and extended its reach into downstream processes, where disposables are increasingly being adopted by biopharmaceutical manufacturers for the convenience, flexibility and cost advantages that they offer. Groupe Novasep, based in Lyon, France, is a global provider of cost-effective and sustainable manufacturing solutions for life sciences molecules and fine chemicals. Novasep’s unique offering includes process development services, purification equipment and turnkey processes, contract manufacturing services and complex active molecules to serve pharmaceutical, biopharmaceutical, fine chemical, food and functional ingredients as well as fermentation and chemical commodities industries. This transaction and other Brocair transactions can be found here. Brocair Partners, founded in 2004, provides financial advice to businesses serving the healthcare, wellness, and pharmaceutical industries. We provide mergers & acquisitions, corporate finance, and strategic advisory services to companies worldwide.